More than half of the world’s population now live in urban areas. By 2050, that figure will rise to 6.5 billion people. Sustainable development cannot be achieved without significantly transforming the way we build and manage our urban spaces. The 2030 Agenda places great importance on issues related to sustainable urbanization, particularly in Goal 11: make cities and human settlements inclusive, safe, resilient and sustainable. The UN Conference on Housing and Sustainable Urban Development (Habitat III), held in Quito, Ecuador in 2016, recognized the importance of adopting a smart-city approach that makes use of opportunities from digitalization, clean energy and technologies, as well as innovative transport technologies enabling cities to improve their service delivery. Importantly, the New Urban Agenda acknowledged that future cities, towns and basic urban infrastructures and services need to be more environmentally accessible, user-friendly and inclusive of all people’s needs. In the morning, the commemoration of the International Day of Persons with Disabilities will feature the launch of the first UN Flagship Report on Disability and Development on the “Realization of the Sustainable Development Goals by, for and with persons with disabilities”. The publication will be launched by Mr. Elliott Harris, Assistant Secretary-General, for Economic Development and Chief Economist (UN DESA). Afterwards, the event will discuss smart inclusive environment and how to apply information and communication technologies to provide better infrastructure, quality services in a safe accessible environment. 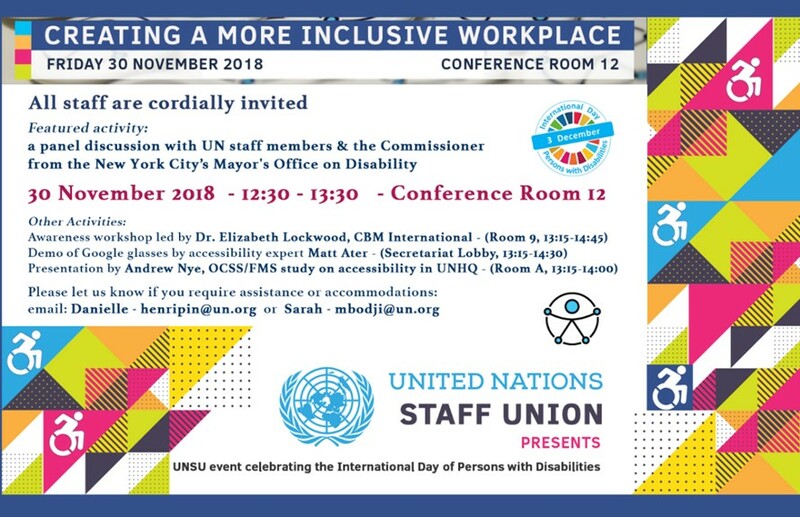 Events for the 2018 IDPD celebration at UN Headquarters in New York will be organized by the UN Department of Economic and Social Affairs (UN DESA) on Monday 3 December 2018, in collaboration with the Office of the President of the United Nations General Assembly , Ecuador, Republic of Korea, Brazil, Bulgaria, Italy, Philippines, United Kingdom, Japan, Singapore, ITU, UN Women and the UN Department of Management. The official commemoration of the day will be held in Conference Room 4 from 10.00 am to 1.00 pm. and 3.00 pm to 6.00 pm. 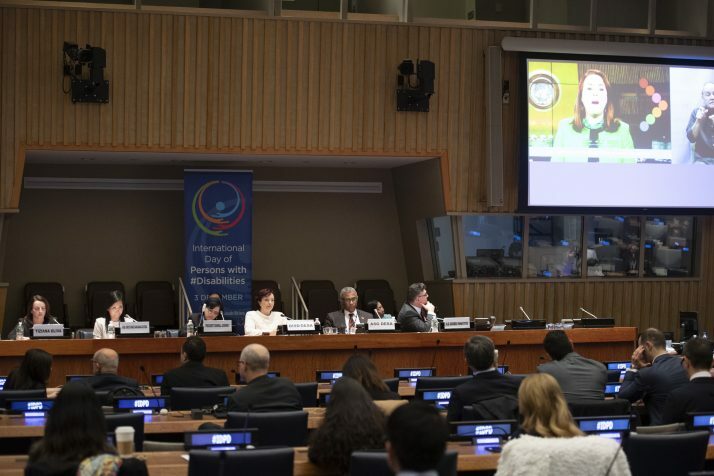 The Opening of the International Day will include the Day’s message from the UN Secretary-General, as well as statements from the President of the 73rd session of the UN General Assembly, Member States and Civil Society Organizations. The panel will discuss recent initiatives on empowering persons with disabilities and on how stakeholders can benefit from the knowledge and expertise of persons with disabilities and their representative organizations to address the multiple forms of discrimination and “leave no one behind”. Achieving disability inclusion will require international efforts and effective partnerships, involving Member States, United Nations agencies, humanitarian and human rights actors, development actors, peace and security actors, local communities and organizations of persons with disabilities. The panel will provide an overview of the international framework of the implementation of the 2030 Agenda for Sustainable Development Goals (SDGs), in line with the Convention on the Rights of Persons with Disabilities (CRPD) and recent progress. The discussion will focus on key challenges and cross-cutting issues in the implementation of the 2030 Agenda and explore innovative solutions for the well-being of persons with disabilities. The panel will discuss how stakeholders can contribute to strengthening the mainstreaming of disability, enhance awareness and improve cooperation into the process of achieving the SDGs at all levels. The panel discussion will explore concrete strategies and policy proposals to develop an integrated approach for smart and inclusive cities that are accessible to all; Recommendations for actions and partnerships at the global and local levels for the creation of an enabling environment to ensure that cities benefit all people, including persons with disabilities; Innovative solutions to challenges that future cities will face in making infrastructure, social services, information and safe environments accessible for all; Sharing of expertise and experience on how cities can foster inclusive urban planning for all by using innovation and technology including artificial intelligence? How can all people benefit? and the way forward for evidence-based research on smart and inclusive urban planning. A panel discussion with UN staff members and the Commissioner from New York City ‘s Mayor’s Office on Disability. The ISPRM celebrated the International Day of Persons with Disabilities with the UN on December 3, 2018 under the theme on empowering persons with disabilities and ensuring inclusiveness and equality. 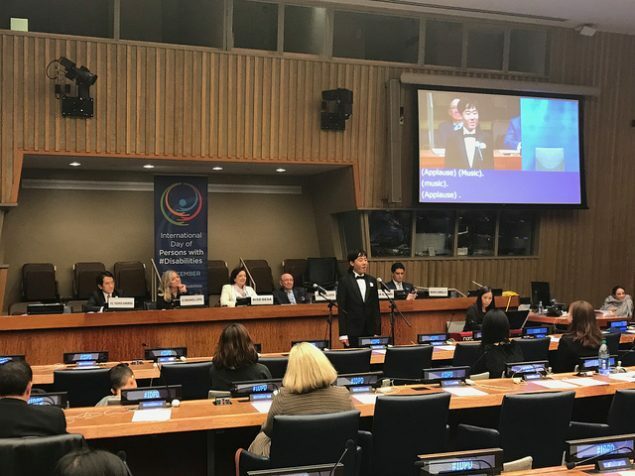 ISPRM, with its over 36,000 researchers and professionals from 103 countries and 61 National Rehabilitation Societies, hereby commits itself to promote a disability-inclusive 2030 Development Agenda for Sustainable Development in alignment with the United Nations Convention on the Rights of Persons with Disabilities.